Aidan...as a "fashion designer". 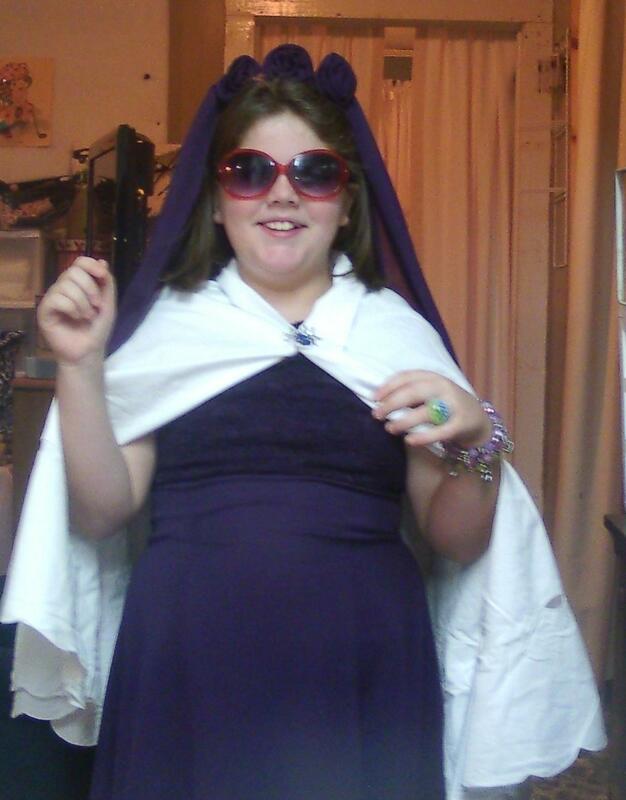 This is not her Halloween costume...just her goofing around! She kept saying, "and WHO are you again? "....and I have no idea why! Hugs! This year' calendar is finished! Woot! Woot! And...it is 40 pages!!! 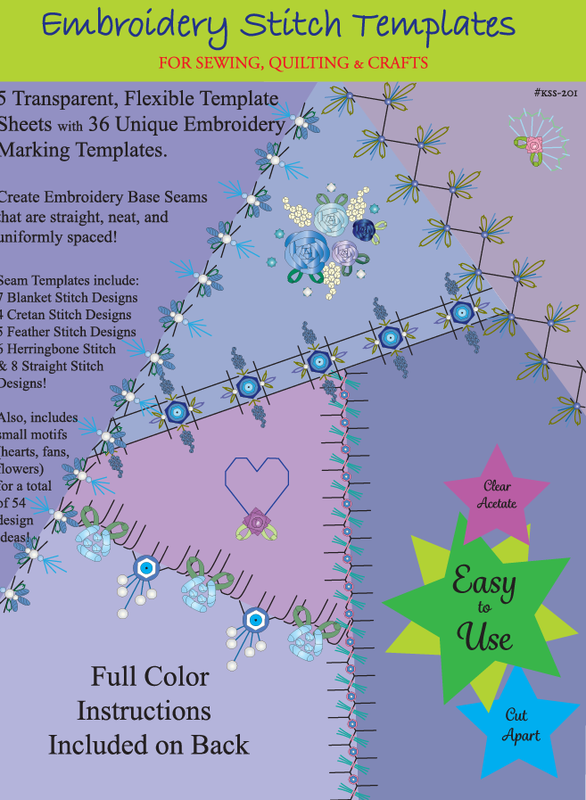 I just could not stop designing...and it is packed with embroidery charts and ideas! Instead of photographs of things created this year...which you've already seen on the blog...or my Pinterest site...I decided to create a "different calendar"...one that can be used to create things...and not just inspire. 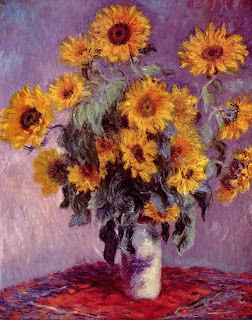 Although it does inspire too I think!. 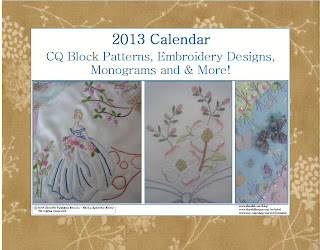 This calendar includes: -- Six crazy quilt traditional block designs (with full size patterns) that can be combined to complete an entire quilt. -- Various designs for standard and silk ribbon embroidery motifs and crazy quilt seams. One large embroidery design (w/optional silk ribbon accents) suitable for an accessory monogram pillow. -- A full second set of monograms for silk ribbon or standard embroidery. 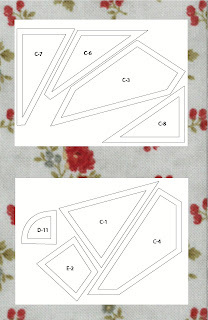 These motifs are about two inches tall, so perfect for using on crazy quilt patchwork. 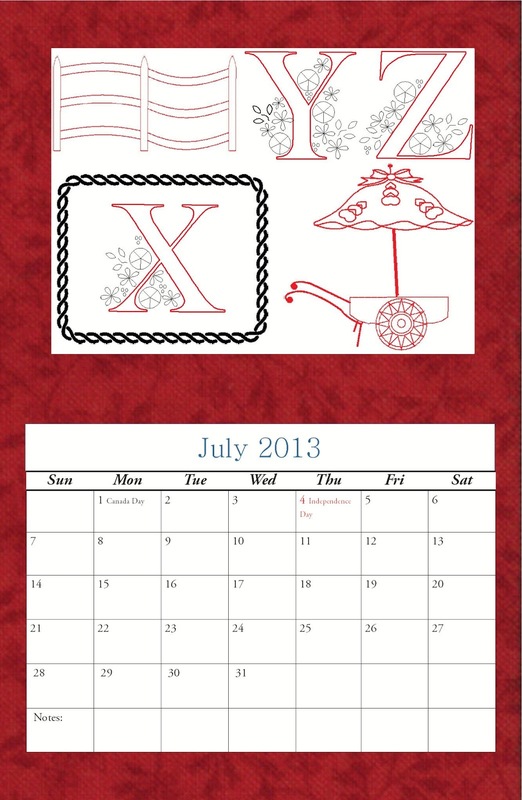 Plus...the calendar pages have all of the US National Holidays annotated in red. Organization...Inspiration...and Project Designs!! 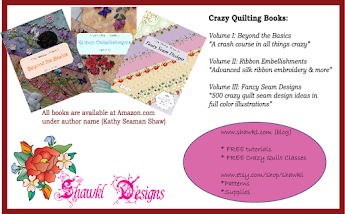 Eleven of the months include design ideas for embroidery...plus there are extra pages of designs after December... January includes a layout for six crazy quilt blocks. Pages of pattern pieces are at the back of the calendar for all six of these blocks...at full size...so you can tear these pages out easily. 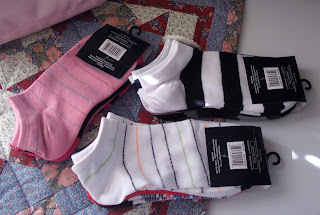 All pieces have a quarter inch seam allowance. 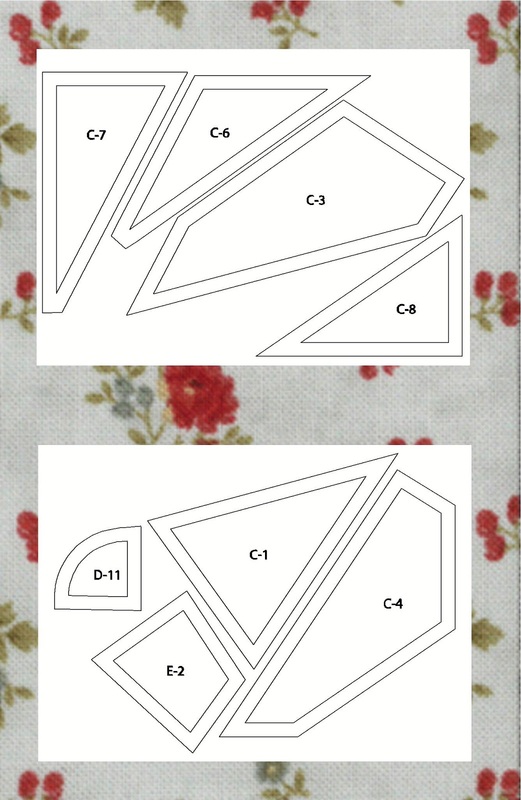 If you are a quilter...and have not yet tried to piece a crazy quilt...these are just like any other style of block construction! And the best news...I kept the price close to the same as last year's thinner calendar...so you're essentially getting 12 pages for free! 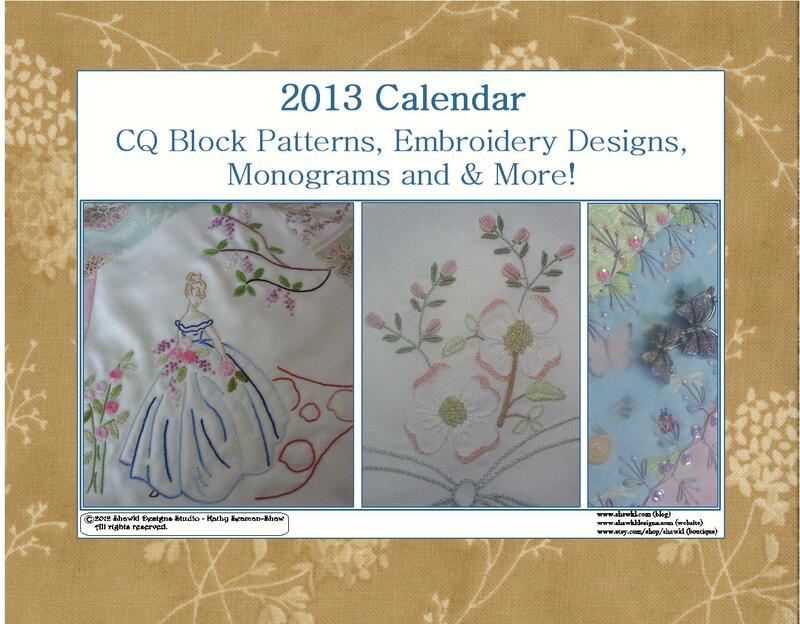 The calendars are available through MagCloud for ordering your print copy today! I managed to get my ornament completed for Rebecca, and in the mail. 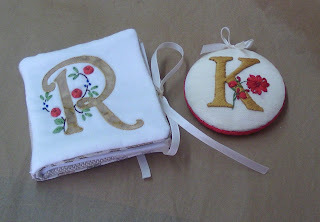 At the last minute, I also decided to do a needle case for her...since I had used her surname for the Christmas Ornie...I wanted her to also have something with an "R" on it for her first name. Want to see the back? 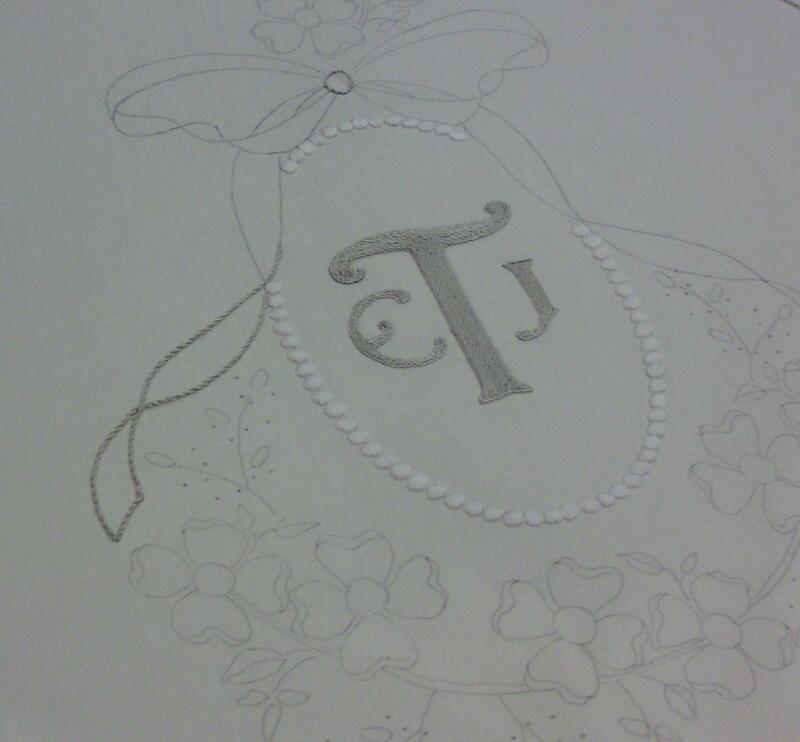 I know I sometimes wonder what the back of a piece looks like. And, in this little dress...the back is very important as it will not be covered. So, anyone who wants to "examine" the stitching will be able too. 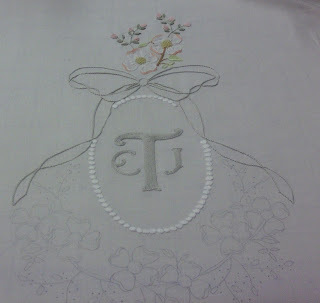 I've tried to keep my work neat...which requires a lot of starts and stops!! 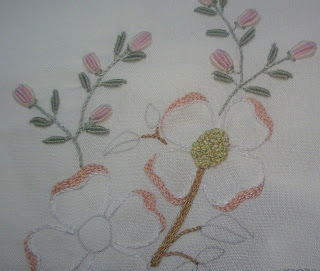 The dogwood petals are done in split stitch...white. I'm also thinking of putting some lines of white inside the petals...but have not yet "made my mind up about that". 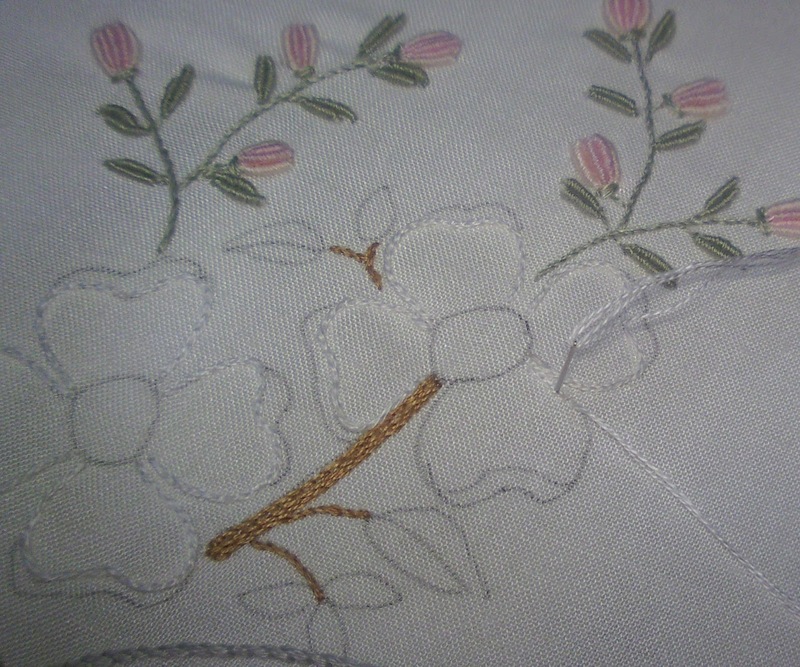 So, what do you think...more split stitch lines? Maybe 2 or 3 per petal...from the center outwards, but not all the way to the edge of the leaf...that's what I'm leaning towards. 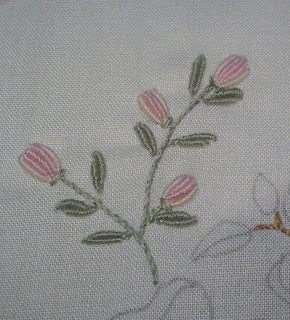 The outer little part of the leaves are done in a medium light rose color. This is not a perfect match to the true color, which is much darker...but for this delicate gown, a darker color would not be good at all. So, I'm taking some "creative license" and changing what Mother Nature really produces. Here is the flower center, and it pretty close to the correct color of the blooms as they first come on the tree. Later in life, it turns a much darker golden and brown mustard color...with green speckled in too. 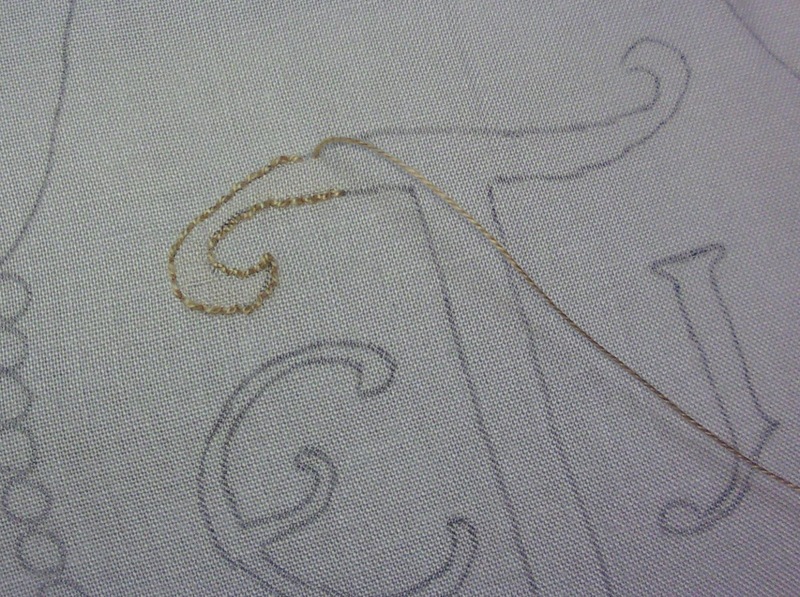 But, for now...four shades of thread are used...cream, light golden yellow, pale green, and pale yellow. 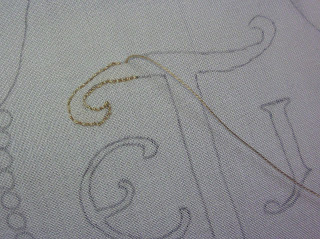 The French knots are done as two types of color sets...beige/light golden yellow and pale green/yellow. Each set is a single ply of each color...combined to create a one-wrap and 4-ply (doubling the threads) knot. 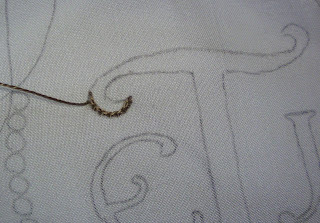 I often combine single threads to get a good variegated blend...try that if you never have, it is a good way to introduce other colors without having an object look "splotchy". At present, the center appears to over-power the flower...and that's the reason I'm wondering about adding those extra "white lines". But, I'm also wondering if the center will be sufficiently balanced by the color on the leaves when they are stitched...so, I'll hold off on the addition of more white until I get those leaves done. 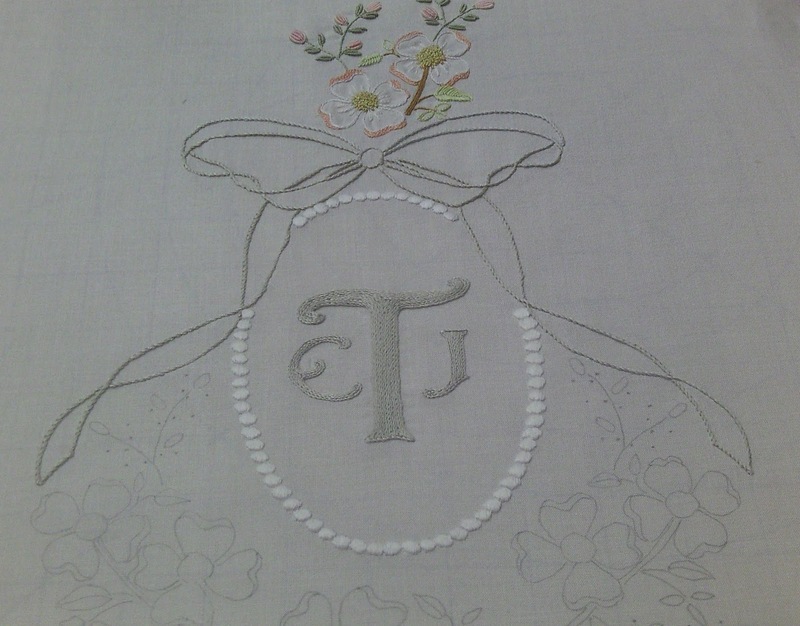 I'm starting to work on the rosebuds at the top of the design for the christening gown. 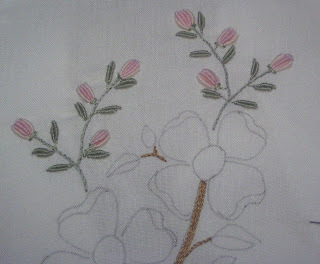 At first thought, these were going to be satin stitch in two shades of pink. But, after all of those satin stitch "pearls" I just could not face doing more of the same stitch! So, I decided on bullion rose buds...which I also love! 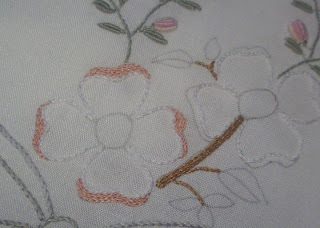 The center is 3 bullion stitches in a color slightly darker than the two side bullion stitches. 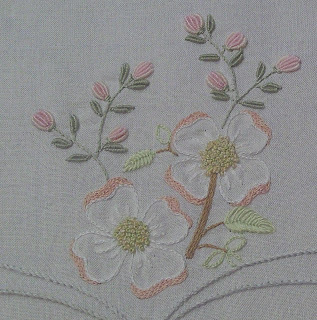 The leaves along the stem are also bullion stitches, done in a medium light gray green. 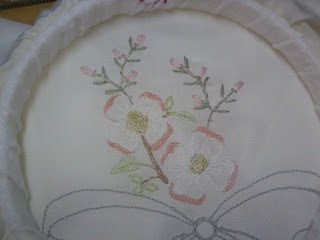 The satin stitched circles .... "pearls" .... are now finished. They are done in 2-ply DMC white floss, with white straight stitches as the under padding stitching. 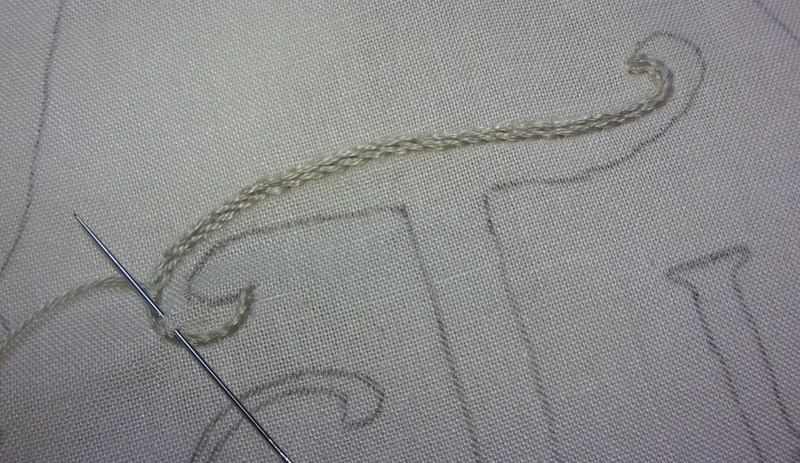 Now, stitching on the ribbon has begun...done in 4-ply DMC silver gray floss...and stem stitch. 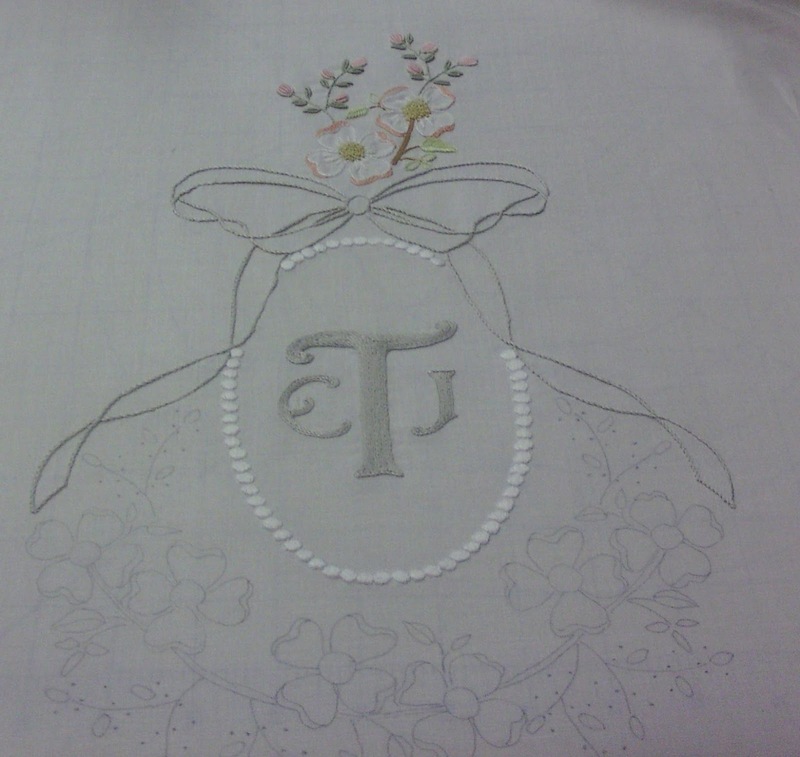 I want the bow and the monogram areas to be more prominent than the floral in terms of stitch size. 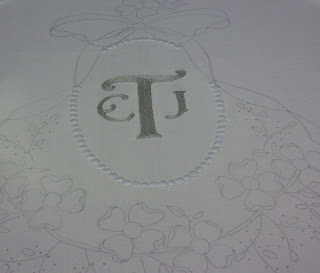 The floral areas will be more delicate and have some color. It would be easy for them to over-power the simple design of the bow and center because of the amount of flowers and the addition of color. 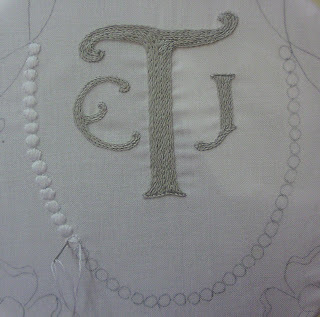 The satin stitching of the pearls, the dense stitching of the monograms, and the thickness of the ribbon outside edge will hopefully offset the amount of the floral and create a good balance. 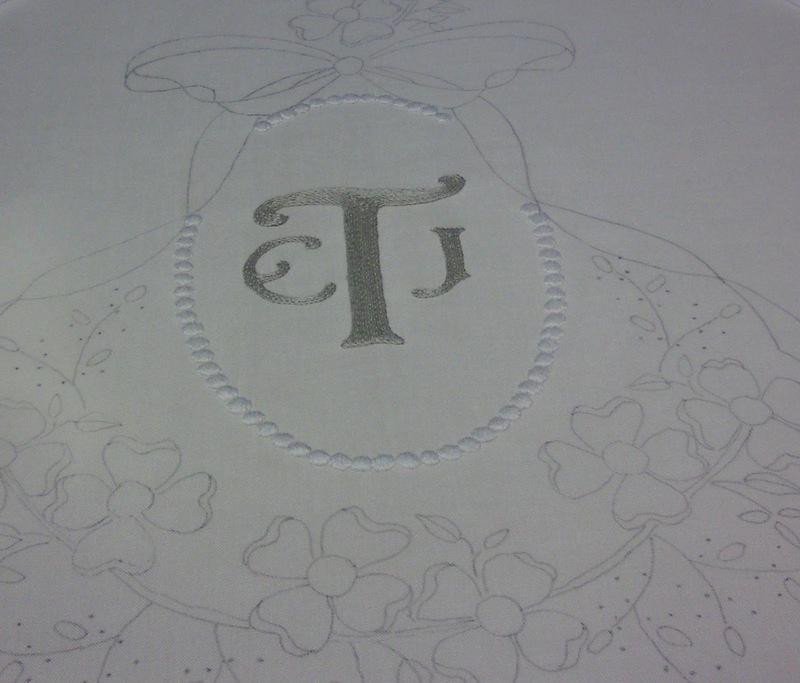 At least, in my muse's design eye...it will go together wonderfully. We shall see.... Hugs! 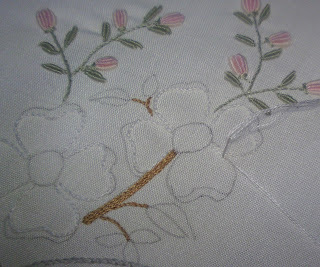 There wasn't much sewing done yesterday...but more on that in a minute. 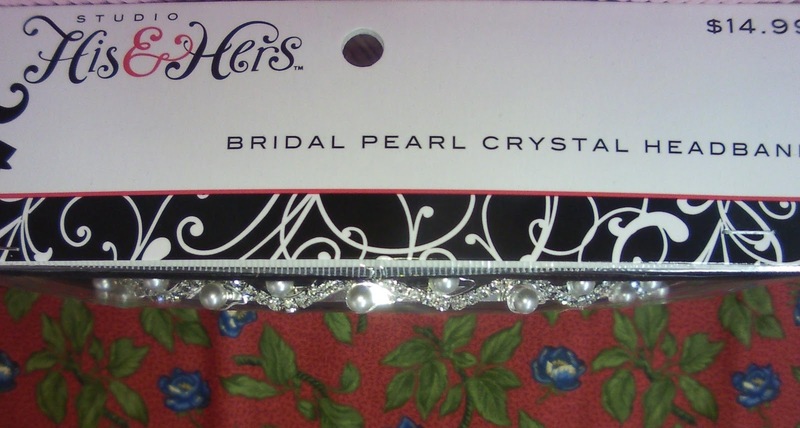 Here is my biggest "find" of the day...a lovely pearl/crystal headband for Aidan. The price says 14.99...but it was 50% off...so was really just 7.50. 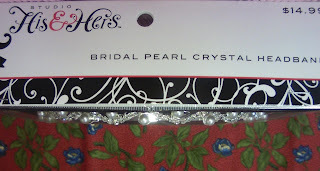 Still a bit much for a little girls headband...but not outragious. 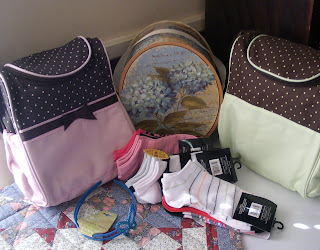 And it went so nicely with the other two items already purchased at Hobby Lobby before. 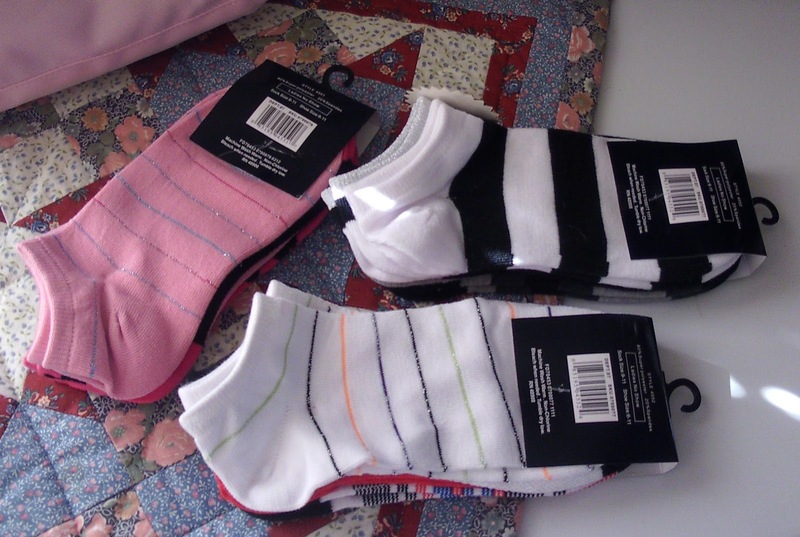 These are part of my "Christmas Stash" of things for Aidan this year. The little pink/brown "overnight bag" I shared with you yesterday...is getting filled with "stuff". And here is where I'm hiding all of my treasures until they get wrapped for Christmas...the top shelf in my office! In plain site! 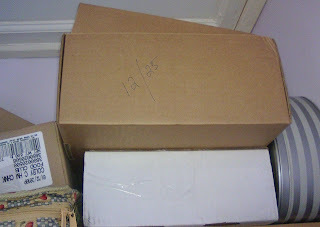 The 12/25 reference on the box...is for me...so I don't (hopefully) have to search all over the house for this stash when I get ready to wrap presents...Ha! Do you have a special stash place? Is it "out in the open"? I also got some special little miniature stuffed animals in the dollhouse area...and have plans for those. But, I'll have to save that for later...to see if my muse is as creative as she things! 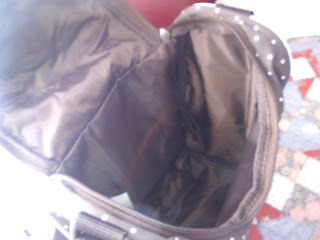 A secret! Sssshhhh...no fair telling! At least, not just yet! It was a long day because I spend 3 hours sitting in the doctor's office...and, because I was more concerned about my trip to Hobby Lobby for threads after that visit...I did not even think to grab any projects to work on while gone! A wasted couple of hours for sure! Lesson learned in that trip! 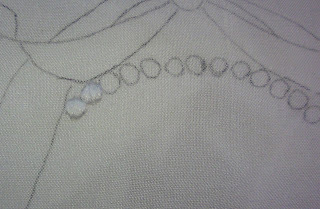 Last night, I did get a little stitching done however...more "faux pearls" finished on the christening gown. They are not perfect...but look pretty good in real life. With all the dogwood and roses...they will be just fine I'm sure. Cool & A Great Price! You don't have to spend a load of cash to find some really cool things! 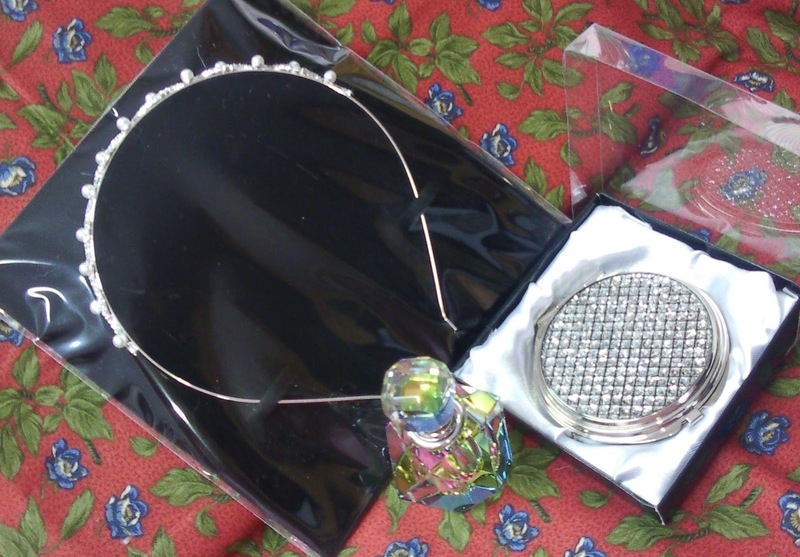 Check out these items I got yesterday at my local Family Dollar store....it's a kind of "dime store"...but everything isn't a dollar. 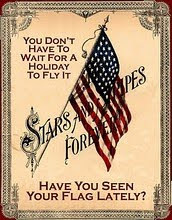 But, not far from it! If I rode bicycles..it would be great to just have a bit of lunch and a couple of water bottles tucked in the side pockets. 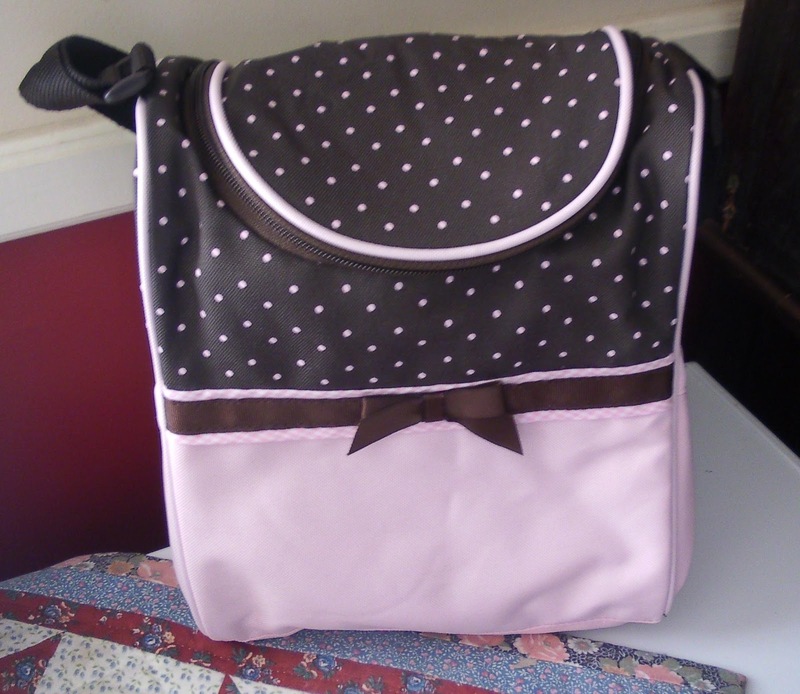 And the inside is lined in a water-resistant fabric too! 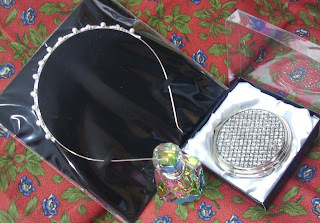 Oh, and the little blue headband in the first photo (I know some of you will ask)...was only a buck! 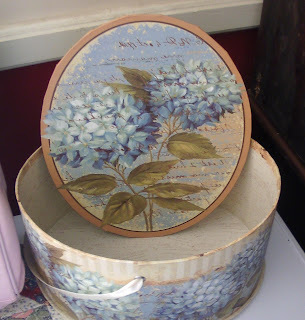 Great finds...don't you think? 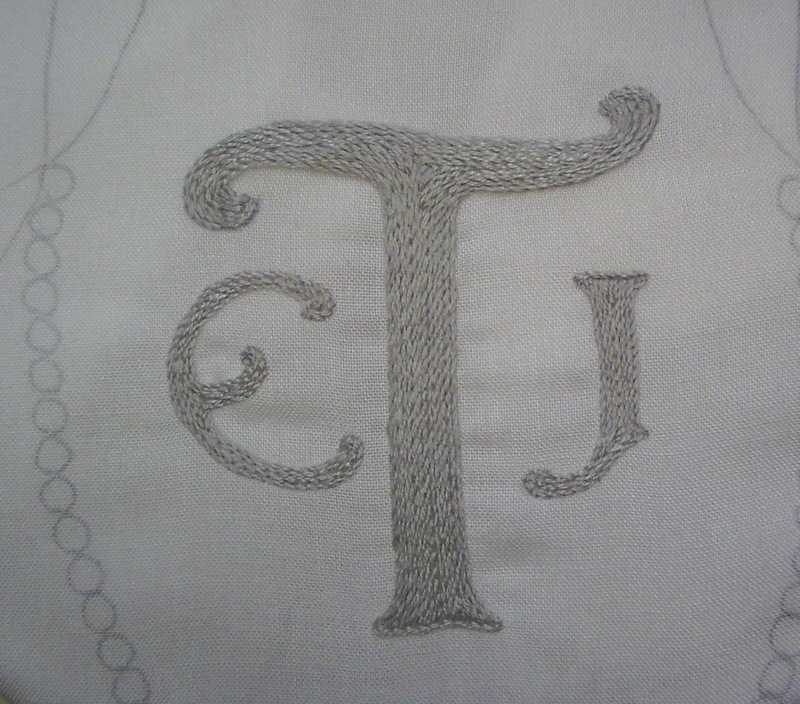 Christening Gown - Initial Finished! 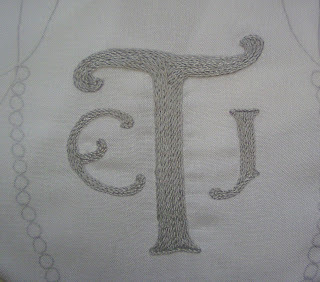 Stem Stitch with 3 strands of silver gray DMC floss was the final decision, and I'm pretty happy with the results. 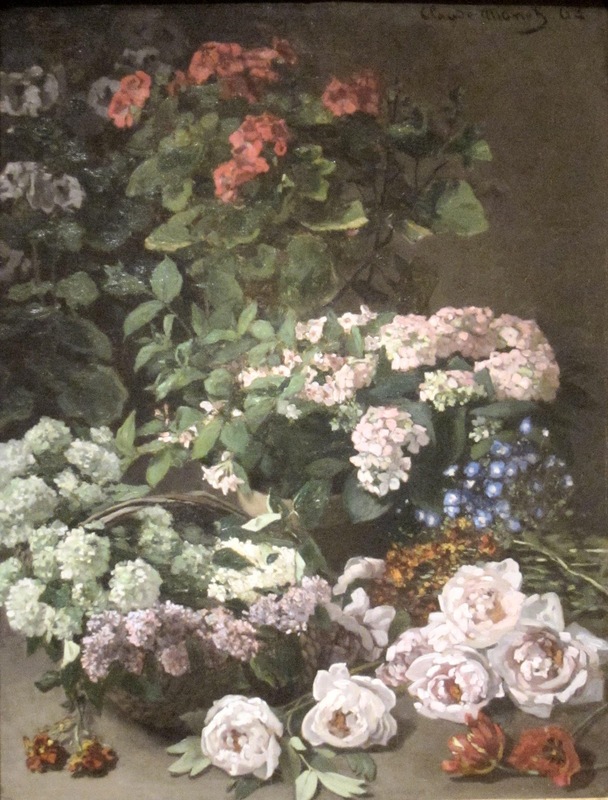 The sheen is more silver at some angles and more gray at others. 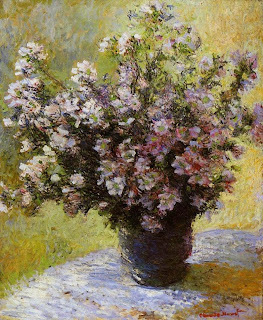 It should blend nicely with the dogwood and rose buds....don't you think? 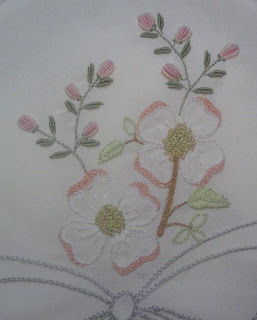 Next is the oval of circles...done in white padded satin stitch...the first two of the top are complete...can you see them? These images are in public domain and might be good for printing silkies...if you like the style. 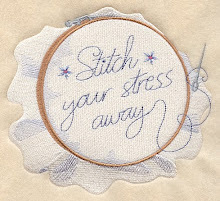 An inkjet printer, some freezer paper, and some tightly woven cotton, linen, or silk and you're all set. Right click to save and re-size as you need. These are also all images of Claude Monet paintings....so, if you think you have seen them "somewhere"...you might have! 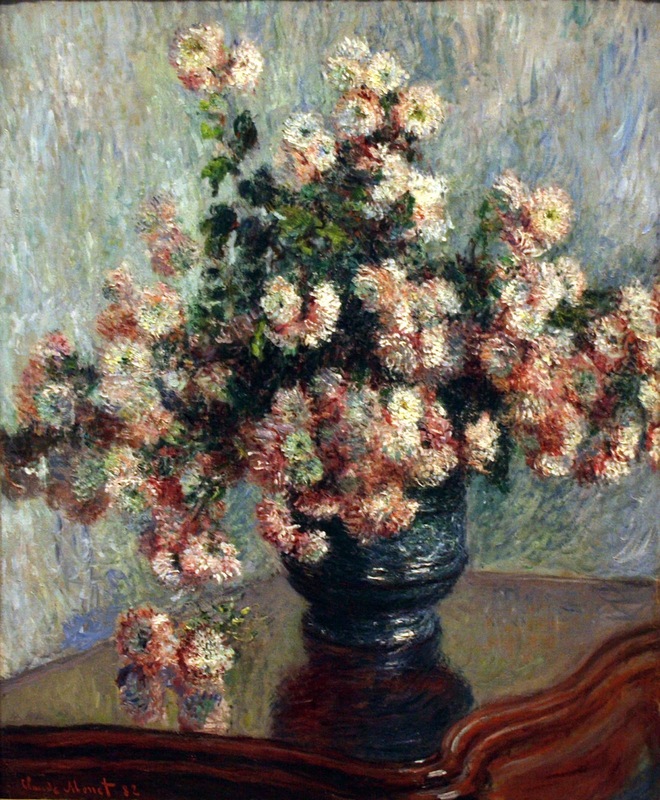 Been to any museums lately? 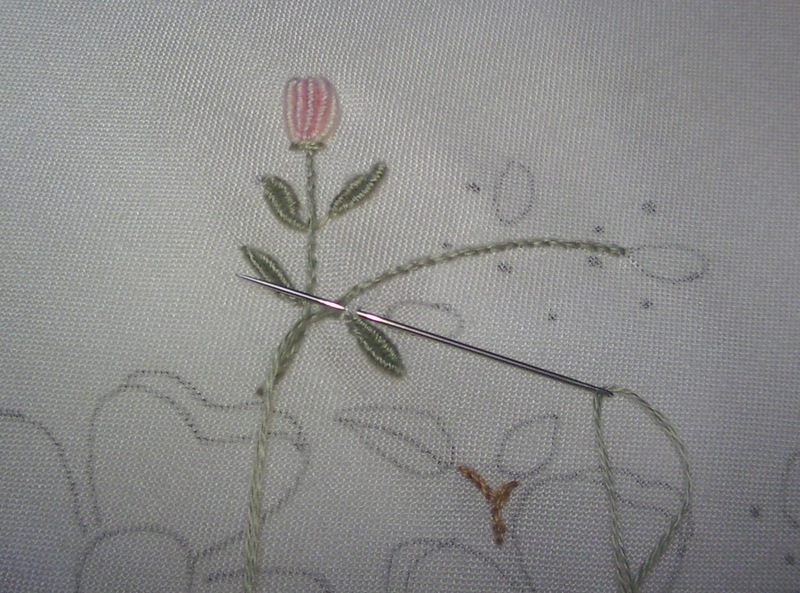 Well, I do like the stem stitch. 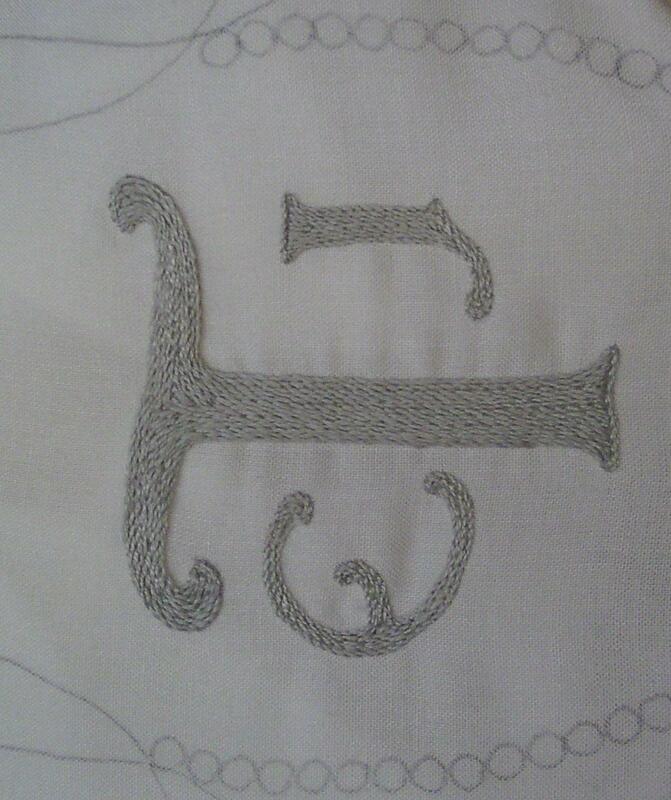 But, when I get to the smaller letters...the perle will be too over-powering for them. Another color? No...So, it's back to floss. Haven't I done this once already?? 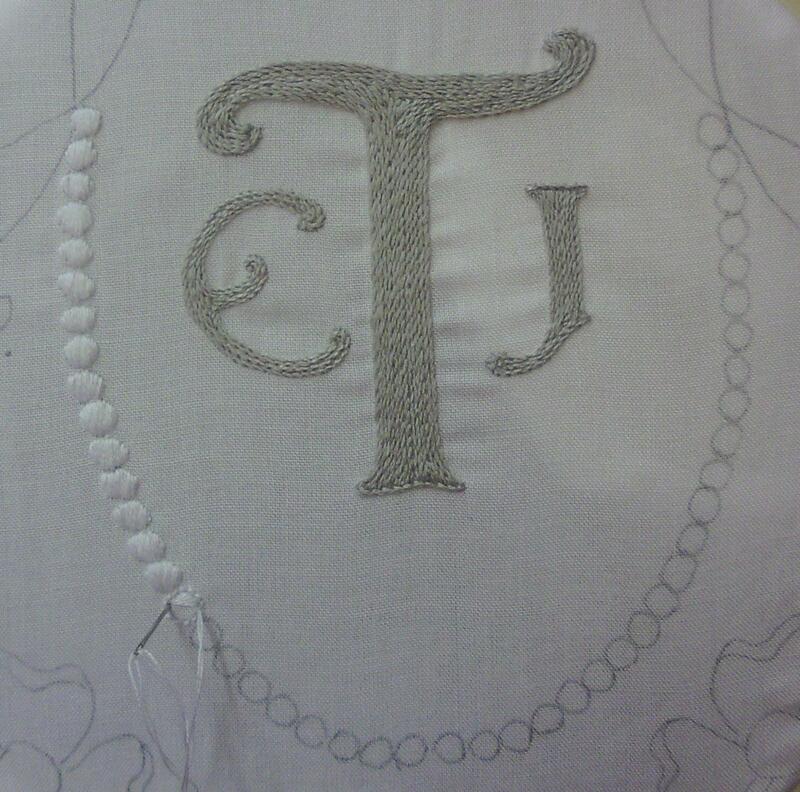 So, this is the plan...stem stitch fill. 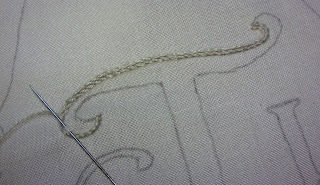 I've stitch two lines so far...and am liking it pretty well. 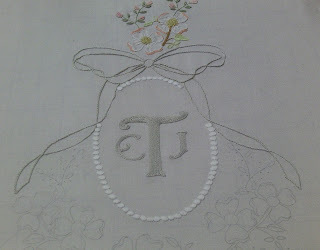 Now to decide how to transition to fill that vertical part of the "T"??? Do you ever have days when you REALLY need to get a project underway...but, it just will not cooperate? 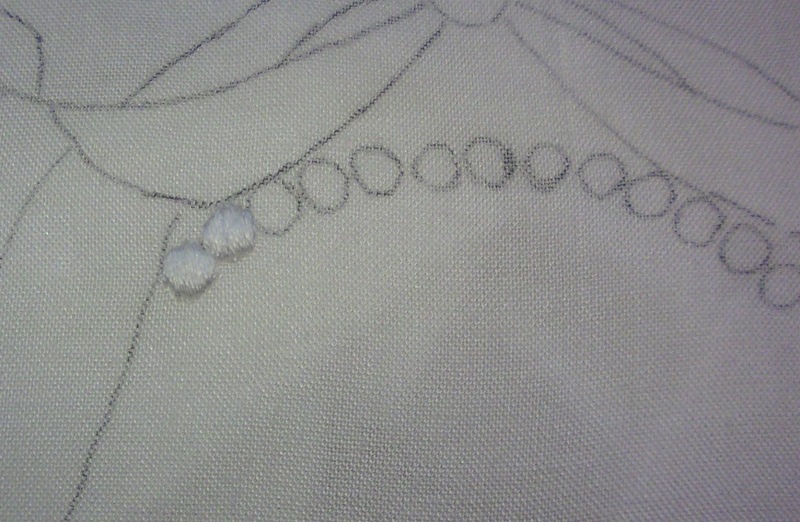 Ah,...perhaps tomorrow will bring better stitching results.